2018. Hardback. 144pp. The Grail Roads is the third full-length poetry collection by Rob Hindle. Click here to read poems from the book. The ribbon of land that runs through north-west France and into Flanders is always being turned over. Each year, the ploughs of French and Belgian farmers uncover shrapnel, bullets, barbed wire and artillery shells; an ‘iron harvest’ that takes in the jumbled debris of the Hundred Years’ War, the Napoleonic Wars, and, in particular, the First World War. The Grail Roads digs deep into the cultural strata of these conflicts, and is haunted by their correspondences and echoes, from Agincourt to Arras. The poems reimagine the ‘quest’ of Galahad, Gawain, and other knights of Arthurian legend, displaced from their familiar mythology and recast as British soldiers on the Western Front. As the war turns attritional, the vision of the Grail darkens; one by one, the men are gathered into a dream of ‘a first and final home’ beyond the wrecked landscapes. The Grail Roads is a story of loss and reclamation, estrangement and fellowship, in which we read the human cost, and human scale, of every journey and battle. 2015. Hand-stamped A5 landscape pamphlet comprising the text of the original pamphlet publication (Longbarrow Press, 2009) and several ‘Illustrations’, one of which (‘Pitchcapping’) is new and exclusive to this edition. 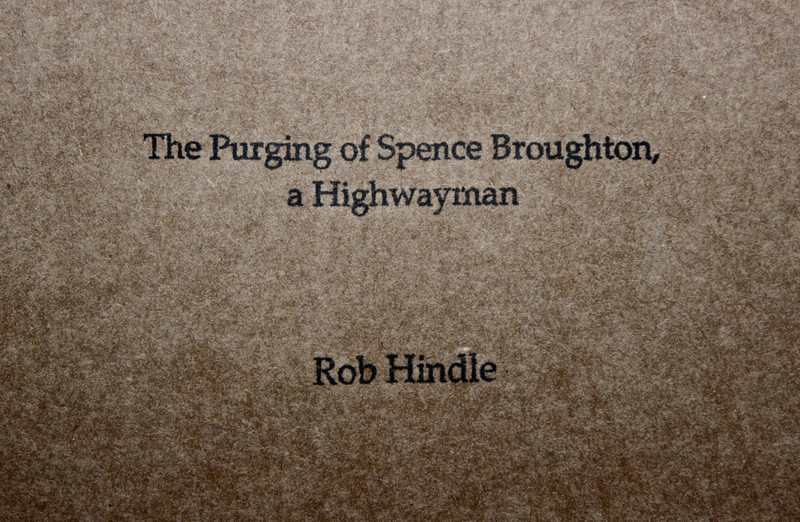 Click here for more details of The Purging of Spence Broughton, including recordings, essays and short films. See Rob Hindle’s website for details of his other publications.